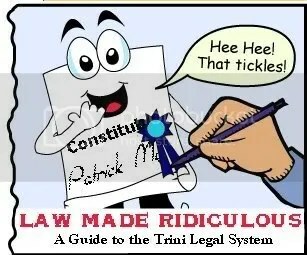 Today Trini Fake News is introducing a new column called ‘Law Made Ridiculous’. The purpose of this column is to be a guide to our unique legal system. We hope to show you how you can not just survive but come to love our legal system. This first column deals with something that all of us have or will have to face at some point in our lives in this sweet country. That is being a witness. If you’re looking for help on being a Jehovah Witness we can’t help you. If you’re above five years old and still believe in such fantasies, we recomend you hold on for our psychiatric advice column. Now on to our column. A witness is the most important person in any case. This needs to be constantly reinforced in your mind. With this knowledge you will be able to properly conduct yourself when in court. The most important thing is that you protect yourself. You do not want to be charged with obstruction or perjury. Most importantly however, you do not want to be killed. In some cases your family and friends may also be under threat. Whether this is a good or bad thing depends on the individual being threatened. The first misconception Joe Public has is that once summoned to give evidence as a witness, he or she is obligated to do so. Many live under the false belief that they can be charged with obstruction of justice. This misconception can be blamed on too many Law & Order re-runs on cable television. Do not apply such fancy and modern concepts to Trinidad, much less Tobago. In the recent case of the State vs. Chief Justice Satnarine Sharma, Chief Magistrate Sherman Mc Nichols demonstrated by his chiefly judicial wisdom, that in fact it is up to the witness to decide whether he wants to give evidence or not. The Attorney General John Jeremie took the honourable Mc Nichols implicit advice and decided not to give testimony at a tribunal hearing. So the wheel turns. If you decide not to follow the learned advice of Chief Magistrate Sherman Mc Nichols or that of Attorney General John Jeremie or the legal luminary who writes this column, and you decide to actually give evidence then I feel it my duty to inform you how to not get yourself killed. The first thing to keep in mind is that any statements made prior to your actual testimony are null and void in the eyes of the law. For example, say you swore in a statement that you knew someone for fifteen years and saw them at least two or three times a week. Once you are on the witness stand you are legally allowed to say that you do not know the person; even if the person is sitting in court. You can say you do not see the person in the court. The prosecution will simply ‘boil down like bhaji’ as we say. I must end this column by saying that the above advice has been proven to stand up in the courts of law in Trinidad and Tobago. The examples given are all real. You can try this at you own risk but then you probably walk outdoors at night sometimes. Given that everything is relative, I would venture that my advice above is less risky to your well-being. To be really safe though, I suggest that you do not witness anything in the first place. It would save both you and the police a whole lot of trouble.